Dometic compact refrigerators bring convenience and efficiency to even the smallest spaces. Every model features a reliable, silent absorption colling system that keeps foods at proper temperatures. 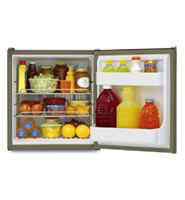 The power control unit mounts outside the refrigerator for easy access. Plus, the gas ignition and thermostatic temperature controls are easy to access through the vent panel for simple and effective operation and monitoring.